Is your money doing enough for you? Is it sitting somewhere making little or no return? 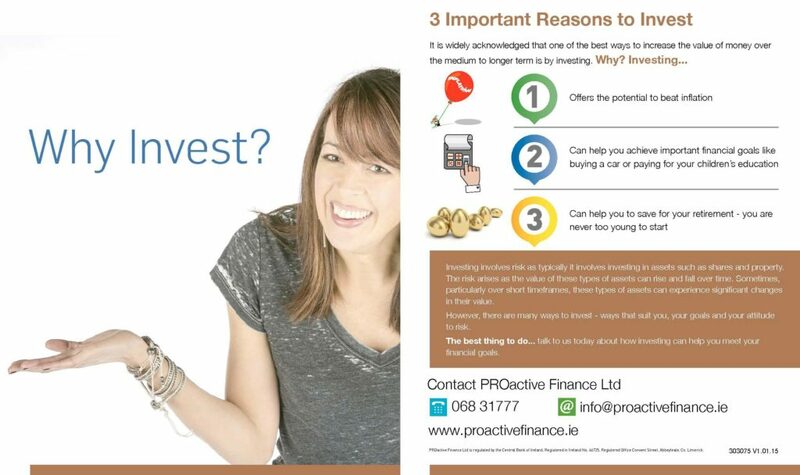 PROactive Finance can offer you a wide range of investment options to suit your needs. Everyone has their own tolerance for market volatility, some want no risk whatsoever, while others are happy to take a small chance. We deal with a wide range of companies, specialising in a multitude of investment products from deposits to capital secure bonds to renewable energy solutions and regular investment funds. We provide ongoing updates and advice on any investment product held with us. Call us now and find out how you can start making your money work for you.